With all that thinking and talking about book ideas, I forgot to mention that my project is in this month's Australian Homespun Magazine ﻿"A Trip To Remember" (project of the month) series. It actually would have looked a lot better in the photo, had the strap been ironed after it traveled by (wayward, late, stress-inducing...) courier service to Sydney, but I guess it has a right to wear its battle-scars with pride. I based the styling on memories of my mother's 'beauty case' from the 1960's. 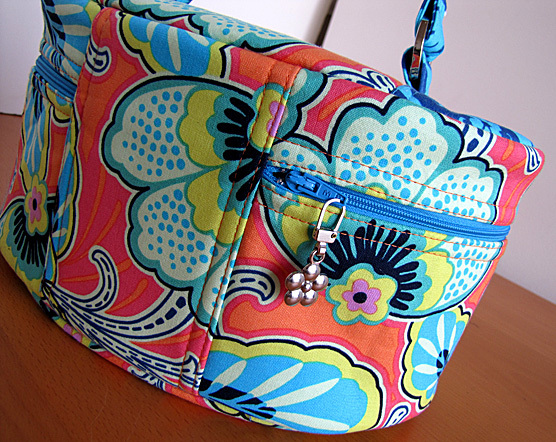 It could indeed be used to carry toiletries instead of craft supplies but it was designed as a crafting-on-the-go bag. It has lots of pockets inside the lid and around the sides to carry tools, threads etc, and a roomy middle bit to carry the work-in-progress. It can open right up and sit on your lap in the car (only if you're the passenger!) or on a train and you can stitch or knit or crochet away to your little heart's content. After the courier was tracked down and the parcel containing the bag was picked up (by the magazine editor ...from a courier depot miles away.... late one rainy Friday evening...), we hoped for smooth sailing with getting the project to print, but it appears that there was another hiccup. There are two patterns marked as the Lid Side Panel. The label on the larger of the two patterns (printed on top of the Grand Adventure ‘Shorts Back’ pattern) should have been labelled ‘Lid centre panel’ and the markings at the top and bottom of this pattern should say Handle placement. A new template can be found here. This little carry-case is a really satisfying sew. My pattern testers all felt very chuffed with themselves when they made their own versions.... and come to think of it, so did I. Everything just comes together nicely and it looks all cute and perky and retro. Lovely. The fabric is all Amy Butler's LARK range. EDITED TO ADD: If you can't get your hands on a glossy paper version of the mag, you can buy a digital copy of this magazine ($3.50AUD) here. Or you can subscribe to the digital magazine for a year. Love it - I want one! I'll buy the mag and add it the "gunna" pile. You're a clever little custard! For those of us who do not have this magazine available to us - is there any way to get the pattern? Thanks for the comment about being able to grab a copy online... already bought and downloaded and imagining which fabrics I'm going to make it in! I shall await it's arrival at coast and country crafts over here (cornwall, still have to pay postage!). When is Jodie's bag!! You make it look so easy. I'm fairly sure there'll be more than a droopy handle when I have a go at this! I LOVE it! and I have the same fabrics sitting here waiting to be transformed. If I hadn't had the week from hell, I'd have done it already, but it wasn't to be. By the way I bought two copies to be sure to be sure and we have one of them displayed in the shop, with the fabric. Pity about the sample lol oh well. I have this to look forward to. Well done Nikki, I didn't notice the handle until you pointed it out, don't fret ( but I understand you did anyway lol) It's LOVELY!! I'm off to buy a copy of Homespun Magazine to get the pattern for this great looking bag. Ooooh fantastic! Now I can blog my beautiful gift. Oh how gorgeous! Might have to buy me a copy! Just gorgeous. Have just bought the downlaod version. What a great pattern. Off to find the magazine if only to admire for a while. 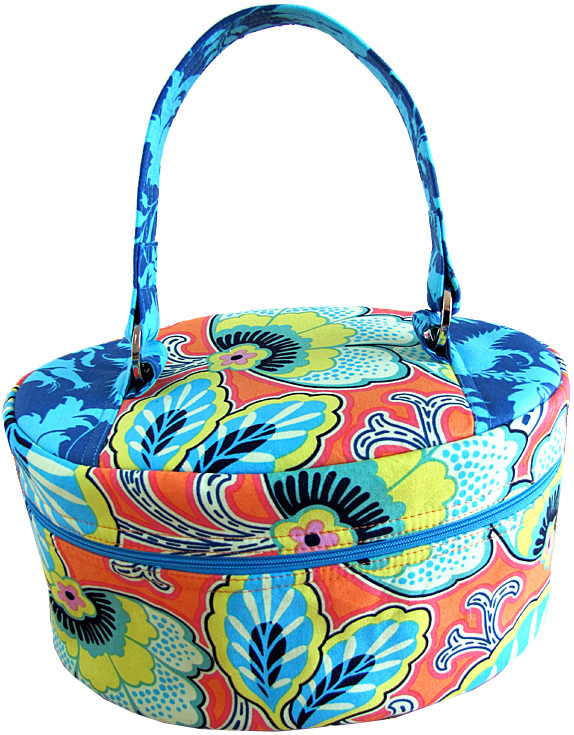 I've just spent a terrific afternoon sewing your craft tote and thinking of my Nan's hair roller case all the time! congratulations on yet another great pattern and instructions. I thoroughly enjoyed making this one and it's going to become the Year 11 bag project next term. so cute! I'm wrapped!